20ft containers are a perfect solution for an onsite tool store or workshop. They the can converted complete with dry OSB board lining, electrics, cupboards, worktops and racking ready to kit out by yourself or fully kitted out by our agent ‘NES Industrial Supplies and Fasteners’. 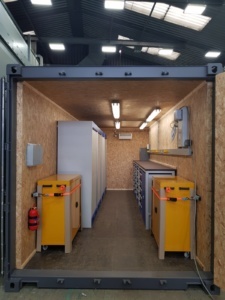 For more information on a complete turnkey tool supply package talk to our partner Neil Eldershaw on 07976 449548 or talk to us direct for just the shell or any other bespoke container conversions on 01922 741756.